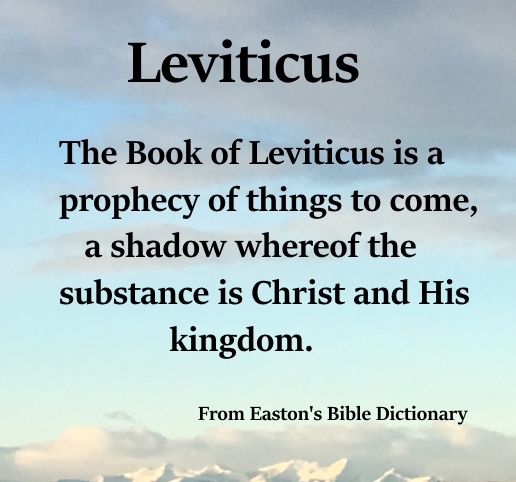 This description of Leviticus is from Easton's Bible Dictionary. A series of laws (Lev 1:1-17:16) regarding sacrifices, burnt-offerings, meat-offerings, and thank-offerings (Lev 1:1-3:17), sin-offerings and trespass-offerings (Lev 4:1-5:19), followed by the law of the priestly duties in connection with the offering of sacrifices (Lev 6:1-7:38). Aaron's first offering for himself and the people (Lev 9:1-24); Nadab and Abihu's presumption in offering "strange fire before Jehovah," and their punishment (Lev 10:1-20). Laws concerning purity, and the sacrifices and ordinances for putting away impurity (Lev 11:1-16: 24). An interesting fact may be noted here. Canon Tristram, speaking of the remarkable discoveries regarding the flora and fauna of the Holy Land by the Palestine Exploration officers, makes the following statement:, "Take these two catalogues of the clean and unclean animals in the books of Leviticus 11:1-47 and Deuteronomy 14:1-29. There are eleven in Deuteronomy which do not occur in Leviticus, and these are nearly all animals and birds which are not found in Egypt or the Holy Land, but which are numerous in the Arabian desert. They are not named in Leviticus a few weeks after the departure from Egypt; but after the people were thirty-nine years in the desert they are named, a strong proof that the list in Deuteronomy was written at the end of the journey, and the list in Leviticus at the beginning. It fixes the writing of that catalogue to one time and period only, viz., that when the children of Israel were familiar with the fauna and the flora of the desert" (Palest. Expl. Quart., Jan. 1887). Laws marking the separation between Israel and the heathen (Lev 17:1-20:27). Laws about the personal purity of the priests, and their eating of the holy things (Lev 20:1; 21:24); about the offerings of Israel, that they were to be without blemish (Lev 22:17-33); and about the due celebration of the great festivals (Lev 23:25). Then follow promises and warnings to the people regarding obedience to these commandments, closing with a section on vows. The various ordinances contained in this book were all delivered in the space of a month (comp. Ex 40:17, Num 1:1), the first month of the second year after the Exodus. It is the third book of Moses. No book contains more of the very words of God. He is almost throughout the whole of it the direct speaker. This book is a prophecy of things to come, a shadow whereof the substance is Christ and his kingdom. The principles on which it is to be interpreted are laid down in the Epistle to the Hebrews. It contains in its complicated ceremonial the gospel of the grace of God"